Are you in the first quartile? If not, you would be wise to contact us today. Contact us for a no obligation laser focused coaching session on your self-assessment results. 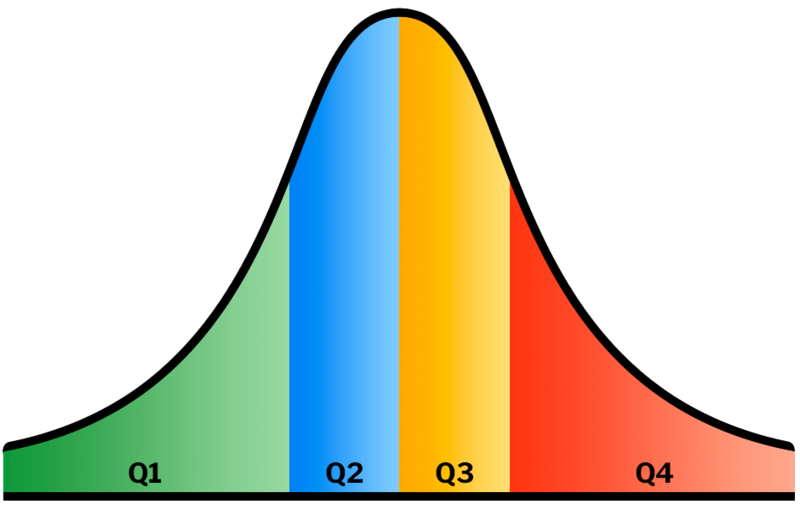 A normal distribution frequently occurs when you compare many observations. For example, companies in the same industry. Half of the companies will score “Quartile 2” or “Quartile 3” not bad but there is room for improvement. Only the best companies will be in the 1st Quartile like students who get all “A’s”. They are the leaders in quality, value and service while effectively managing costs in whatever they do. These are the most highly valued and for good reason. In the 4th Quartile are companies with borderline profitability. These organizations struggle with poor cost control, unreliable productivity, quality issues and a host of other symptoms stemming from their root cause problems. Download one or more of Salvis Group’s free self-assessments. Complete it to find out how you score. Then, if you like, book a no obligation confidential debriefing to discuss your results. Are you as a business owner seeking optimal sale price? Are your assets healthy & fit for purpose? Are you experiencing “chaos” in your business? Take control. Are you really executing your strategic plan? Are you totally in sync and optimized? Are you confident that there are no hidden elements that could prove catastrophic?